A man from Sierra Leone has been arrested at New York's John F Kennedy airport with uranium samples allegedly concealed in his shoes. 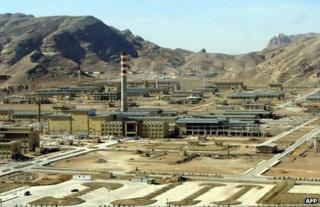 Patrick Campbell was charged with attempting to broker a sale of 1,000 tonnes of yellowcake uranium to Iran. He allegedly made the offer to US undercover agents, thinking they were representing the Iranians. Samples of raw uranium ore were found beneath the inner soles of his shoes, an agent said in a US court complaint. When enriched, yellowcake can be used in the manufacture of nuclear fuel and weapons. Iran is suspected by the US and others of secretly seeking to acquire nuclear weapons despite protestations that its programme is for civilian energy use only. Mr Campbell is accused of seeking to arrange the export of the yellowcake from Sierra Leone to the Iranian port of Bandar Abbas, packed in drums and disguised as the mineral chromite. He presented himself as someone affiliated with a company engaged in mining and selling uranium in Sierra Leone, according to the US complaint, a copy of which was published by the New York Times. He had allegedly responded to an advert in May of last year on the website Alibaba.com seeking to purchase uranium that was placed by an undercover US agent posing as an American broker representing persons in Iran. When confronted, he admitted to having brought a sample of the raw uranium ore with him, the complaint says. It adds: "Campbell assisted the agents in removing the uranium from beneath the inside soles of his shoes and plastic bags containing uranium were recovered from two of Campbell's shoes." If convicted, Mr Campbell faces up to 20 years in prison and a $1m (£642,000) fine. The complaint against him was filed in Florida, his ultimate destination at the time of his arrest.